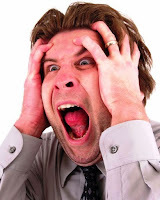 Have you ever been in a stressful situation? Actually, I shouldn’t have asked this question at first place because every single person in this world would certainly have gone through not just a single but many stressful situations throughout entire life. What I should have asked instead is that have you ever noticed how exactly your own body responded under stress. When you realize bodily responses to a stressful or precisely speaking - to a life threatening or survival situation then perhaps you might be able to alter it for good. Are you getting me clearly? Let me help you by explaining by sharing a real incident which took place with me quite recently, in an unexpected manner. How me and my wife quickly understood and altered our bodily responses under that particular situation dramatically affected our very well-being. This story is really interesting and I hope you would like it for sure. Almost a one month ago, my wife and I went to visit a historical place. The place was Gingee fort, situated 150 KM away from my home in recently flood hit Chennai city. It’s one of the well built, almost impregnable and also nicely preserved forts in entire world. We started to climb by taking stairs built using stones. We got mesmerized by surrounding panorama and natural rock formations on way up the top and I kept myself busy taking photos. Finally, we entered in citadel which was a narrow and long strip of land, artificially created on top of large and continuous rock. I was really excited to catch images by standing at highest point of citadel but it was about to turn into horror within just few moments. 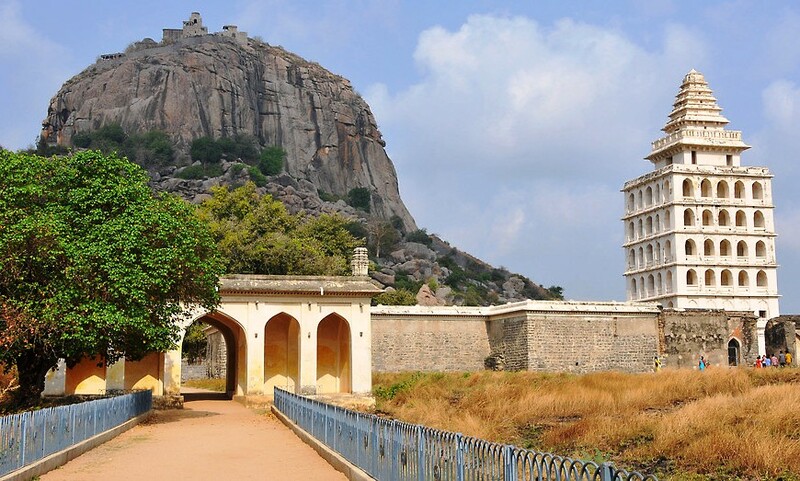 Gingee fort was praised as "Troy of East" by British army officers. I was heading on a narrow & rough pavement and my wife was right behind me. Suddenly, I saw an alpha male monkey which was silently marching towards us only. I stopped walking only to detect what he was intended to do with us. As I realized that hair surrounding his face were raised straight and he was bearing his long and sharp canines, both of us went frozen. We were completely unsure about how to respond to this unexpected and potentially threatening situation. Hungry monkeys attacking humans and injuring them for food is very common (at tourist sites). Clock was ticking and monkey was closing very fast. My brain was rapidly gathering up and processing information about potentials risks we might be running into. Soon after realizing that the aggressive monkey was planning to attack us in his own territory, very first thought came into my mind was to run for life. This was very natural and also safer choice at that moment but we couldn’t have acted upon it effectively. 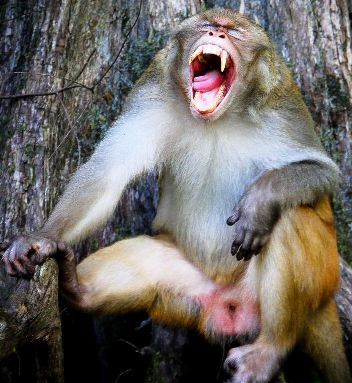 If we would have started to run away, monkey could easily have attacked us from back and injured any of us with his sharp teeth. On the other hand, a single mistake while running on narrow, rough and curly pavement could have resulted into serious injuries or in worst case - thrown us off into a deep moat which was running alongside the pavement. Also, thick but short grass both side of pavement wasn't enough to provide enough cover. For both of us, it was matter of survival. Even after calling aloud, there was nobody around us to run for helping. If we would have offered handbag to monkey then we could have lost a camera, a cell phone and dry fruits kept inside it. It could have cost a lot to us. Hence neither running away from nor surrendering ourselves to that wild mountain monkey was a better choice. After gathering my courage and recollecting best defense moves, I firmly told my wife to stand firmly and get into fighting mode. Both of us started shouting or roaring very loudly at and also blow clenched feasts towards the monkey. Also we started sweeping the handbag from one side to another so we could hit that creature. All we wanted was to look more aggressive, fierce and relentless in comparison to the attacking monkey. For next couple of minutes, we continuously kept shouting, roaring, blowing our clenched feasts, sweeping handbag and throwing whatever we could pick by our hands. Monkey wasn’t giving up that easily but our strategy to appear aggressive and potentially harmful proved fruitful at the end. After few iterations of attack and retreat, monkey gave up to our collective fierceness, aggression and potential harming capacity and ran away. Rush of adrenaline and sense of safety wasn’t fading quickly though. For further safety, while we were climbing down the fort, I carried a long and strong wooden stick in my hand. Why we were so sure about saving ourselves by fighting back only? My wife and I were far more superior to the monkey in terms of body size and mass, even while lacking required maneuvering capabilities, tactics and skills which untamed monkeys normally have. Monkey had to retreat only because we were appearing bigger than normal through aggressive, outreaching body movements, continuous roars, grunts and loud shouts. We could safely came down from citadel of Gingee fort without loosing valuable stuff and getting hurt only because we chose to fight in face of an unexpected and life threatening challenge. Nothing else but that very incident inspired me to write this article. Until we don’t understand how exactly our brain and body naturally and sequentially responds in stressful situations, we may not able to alter it if needed or also appropriately respond to, co-ordinate with and assist others who have chosen a particular response unconsciously. Each response is nothing but a marvelous gift of evolution, a proven strategy through Darwinian natural selection. All of these responses are primitive and they evolved billions of years ago and all (living) creatures act upon them no matter how big or small their brains and bodies are or kind of habitat they live in. Responses have been given by following a sequence in which each creature gives them away. 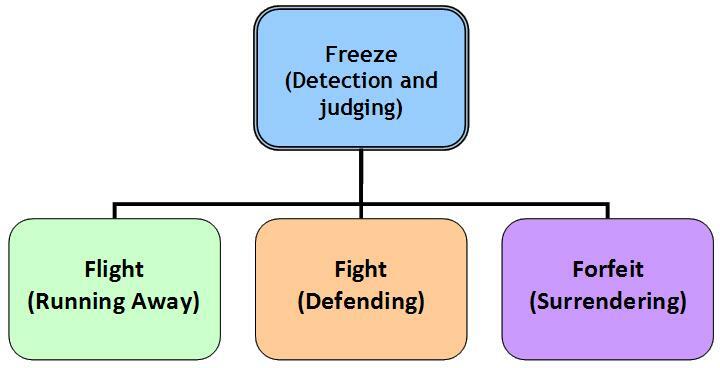 Freeze response in very basic, independent and also mandatory while other responses are strategy based. Each secondary response is either given away either as a final solution or it might be tried after any other response fails. For example, a person might start running away or fighting back but surrender at last after realizing that both responses could do more harm. Also, a person or creature can choose different combinations of three responses to protect itself and render expected results. 1) Freeze (Detecting): Before anything else happens, this is a very first response that every creature gives under any stressful as well as normal situations. Before reacting to an impending situation, we all need to detect and understand what is going on exactly. As if we accidentally receive an electric shock, we keep ourselves still or simply stop making any kind of body movements. This helps us to concentrate on and collect clues about an impending situation or any approaching entity. Our brain tries to gather up and process clues at quickly as possible. Freezing time might vary from one person to another. Duration of staying in frozen or detection mode is entirely dependent upon how quickly we could figure out our own capabilities, risks subjected with our involvement in an impending situation or with any approaching entity and also potential consequences of very next step we take in defense. That’s the reason why some persons appear frozen, unsure or locked-up over a longer duration in face of danger before giving further response. On the other hand, some of us react quickly but inappropriately at most of time, only because of not being able to judge outcomes of particular response. 2) Flight (Running away): After judging a situation or approaching entity as potentially harmful and assuming that we may not survive (by fighting with) same, we unconsciously choose to move away from physical space we share with it, its possible reach or attacking range of it as quickly as possible. Flight or running away is a very basic yet warrantable response especially to novel or unexpected situations, approaching or emerging entities, concepts, ideas or thoughts because we don’t have any experience about possible results coming out of previous encounter or engagement with them. Unlike freezing over a considerably long amount of time, running away from danger happens comparatively faster. Flight or running away is most likely response to be given by our limbic system because it’s matter of survival. It’s also equally interesting to know that physiological changes taking place corresponding to flight response are almost indistinguishable from that of fight. While giving both responses, our heart increases blood supply to major muscles of our body. In result, skin temperature also increases. 3) Fight (Defending): After judging a situation or approaching entity as potentially harmful and assuming that we should, can or have to defeat it; we unconsciously choose to prepare ourselves for launching an attack. We don’t keep ourselves away from physical space we share with it, its possible reach or attacking range of it. Fighting or defending is a very tempting response especially to known or previously encountered situations, approaching or emerging entities, concepts, ideas or thoughts because have experience about results which came out of previous encounters or engagements with them. Unlike running away quickly, launching an attack might take some time because one needs to decide an effective strategy and also weapons to overcome the source of danger. 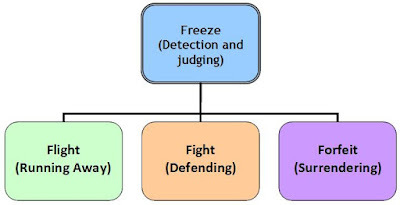 Delay in freeze response can be reduced by enhancing detecting and judging capacity e. g. a well-trained martial artist, soldier or spy can launch attack on its opponent(s) or enemies much quickly than an ordinary person. It’s James Bond who pulls trigger far before his enemy does. Right? 4) Forfeit (Surrendering): When neither running away from nor fighting with seems to work, we choose to surrender ourselves in face of potentially harmful situations or entities. Very dramatic changes happen to our posture. We unconsciously choose to appear small, self-consoling, immobile and harmless. Also we try to conceal and protect our most vulnerable body parts like neck, chest and ventral cavity i. e. abdominal area by arching our back and pulling our legs closer to body. Haven’t you ever heard about brace position? 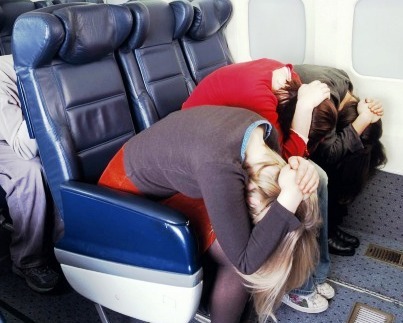 It’s always exercised during aircraft crash to save ourselves from physical injuries as much as possible. While aircraft is crashing, we know that only turning ourselves into a turtle could possibly save us from injuries cause by impact. Showing palms of both hands by raising them about our shoulders in front of policemen or soldiers is surrendering, as well as ‘playing dead’ or lying on ground without and not making any movements in front of a giant grizzly bear. I’m quite sure that many of us (including biologists, psychologists, behavioral researchers, nonverbal communication experts and personals handling emergencies that involve people) confuse forfeit response with flight response. If you have same confusion at deeper level then please go through the aforementioned details again to know clear differences among each of them. On the other hand, forfeit isn’t considered as one of basic responses because term ‘Fight-Flight-Freeze’ or simply ‘Flight or Fight’ was very popular among us till now. Only ability of precisely detecting behavioral changes and nonverbal clues subjected with these four basic responses given by body can ensure better and harmonious results for individuals, groups and organizations that have to face and deal or interact with people and creatures on routine. Not just specific people but we all have to do it day in and out. Isn’t it right? In our large and complex world, with people growing in numbers, detecting nonverbal clues accurately is crucial and moreover - life changing. Whenever I recall that brief incident, I truly appreciate these responses and also very ability to detect them in ourselves and others. If we would have failed to detect aggression in that monkey before choosing to fight over running away then fate of me and my wife would have been entirely different for sure. Be adventurous and exploring but stay safe! Labels: Animal Kingdom, Basics, Biology, Evolution, Facial Expression, Intelligence, Interpretation, My findings, Neuro-science, Psychology, Social Practices, True Stories, Why we do? Entire theory explained with a very good example!